Robert Cohen is the author of four novels, including most recently Amateur Barbarians and Inspired Sleep (Scribner), and a collection of stories, The Varieties of Romantic Experience (Vintage). 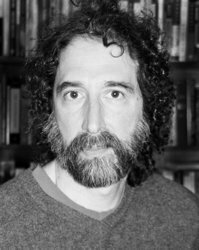 His awards include a Whiting Writers Award, a Guggenheim Fellowship, a Pushcart Prize, the Ribalow Prize for Best Jewish Novel, and a Lila Wallace-Readers D igest Writers Award. His short fiction and essays have appeared in, among other magazines, Harper’s, The Paris Review, The Atlantic Monthly, The Believer, and Ploughshares. A former Briggs-Copeland Lecturer at Harvard University, he has also taught at the Iowa Writers Workshop, Rice, and the University of Houston. Now he teaches at Middlebury College and in the Warren Wilson MFA program. He lives in Vermont with his wife, his three children, and his many minor but insidious discontents.